If my grandmother, Mary, was still roaming the Earth, she would have turned 93 this week. She passed over to the other side on March 26 of this year. 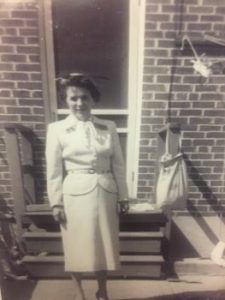 Up until the time that she moved from the eastern shore of Maryland to an assisted living facility closer to my neck of the woods, my paternal grandmother and I were not very close. I honestly didn’t know the woman in a REAL way for most of my life, which was simply a sad circumstance of distance and limited together time. 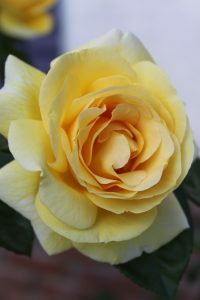 What I did know was that she loved the color yellow, especially when it came to roses. Winter was her favorite season, because she was born on December 18, adored the Christmas holiday, and married my grandfather on Valentine’s Day. Her dress caught fire at the age of 9, and she spent nearly four years in a hospital recovering from the burns. She lost her second child, a 3-year-old son, in a furnace fire. Her favorite singer was Nat King Cole, and she favored little dogs. I learned a great deal more over the last 10 years of her life, however. During our many visits – often over cheese and crackers and her potato vodka-tonic cocktail – she unknowingly stitched together her life story for me and revealed who she REALly was. That time with her was truly a gift. When my dad asked me to deliver the eulogy for Grand-mom’s funeral mass, I was honored. I also felt an intense pressure to get it right. In the days leading up to the service, I asked her for guidance and inspiration. I actually prayed for signs from everyone on the other side, as I often do. I needed some ideas about what to include and how to integrate just the right blend of history, humor, and love. I had to know what she wanted her last message to be. About two days before the funeral, when I was cleaning out cupboards and packing the kitchen up for our upcoming move, a piece of paper fell from the back end of our junk drawer, skimming my cheek on its way to the bottom of the cabinet below. When I sat down on the tile floor to read it, I giggled a bit, knowing that my prayers had been heard and that my sign (and help) had come. What literally fell into my hands that day was a copy of one of my favorite excerpts from the books and teachings of author, Neale Donald Walsch. Interestingly enough, I hadn’t sat down to read any of his works for quite some time. As the Universe (and my grandmother herself) would have it, though, an entry that I had borrowed for a Christmas Day message a few years prior divinely landed in my lap, delivering exactly what I had requested. 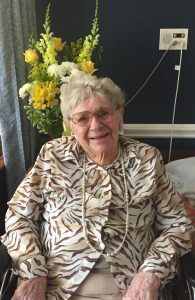 The excerpt I chose to build my grandmother’s eulogy around was all about fully embracing and appreciating the moments of life. I feel it is worth sharing these profound sentiments with you, especially as you close the gap on the current year and ponder what you will create in the next. There are millions of them. Billions of them. Trillions of them. They are called moments. Strung together, they are called a life. No single moment has a prescribed length. It could last one second, one minute, or one hour. Or much longer than that. 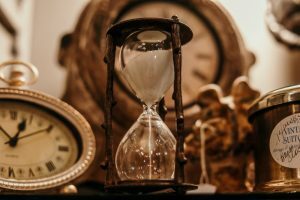 Yet there is something unique about the most important moments: the longer they are, the shorter they seem. The shorter they are, the longer they seem. If you have ever spent an evening saying a final goodbye to a dearly-loved one, you know that the minutes go oh too fast. If you have ever spent a few seconds looking deeply into the eyes of your beloved, you know that time can stand still. Thus, a few seconds can seem like an hour, and an hour can seem like a few seconds. It is their content that produces our experiences of their length. In whatever way they are experienced, however, moments come and moments go before you know it, and then they are called memories. They become etched in your mind. They are yours for a lifetime, and no one can take them away from you. Nor can you rid yourself of the ones you don’t wish to keep. Moments that will soon turn into memories are going on right now, as you are reading this . . . and through all of them – the slow ones and the oh too fast ones – the good ones and the not so nice ones – the fun ones and the ones that are boring and dreary – there is only one thing that matters. Because most people have no idea who that is, they miss it. Moment, after moment, after moment, they miss it. After many years, they realize this, but by then it is too late. Nothing that can be done about the moments that have passed. But there is good news. Something can be done about the moment that is coming up. And about the one after that. And the hundreds more that will arrive this day. And the thousands more that will appear this week. And the millions more that will happen this month. And the billions more that will happen this year. And the trillions more that will present themselves before you die. Yes, about those something can be done. 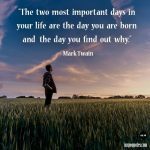 And as you contemplate what you can do about those upcoming moments in your life, and how you want to experience them, you will know one thing. What you don’t want to do is waste them. Not anymore. No . . . not anymore. As I read the final lines of the excerpt at the closing of my grandmother’s eulogy, a million tiny dots connected in my mind, and I experienced more clarity than I had in years. From the podium, I caught my husband’s gaze, and I knew that he felt it too. Just one month later, I resigned from my safe and secure job and set out to follow my passion. It was time to create the blog. It was time to write the book. I decided never to waste any of my precious moments again. My grandmother gave me a priceless and irreplaceable gift: the inspiration to live for REAL. When hearts stop beating, energy changes form and beings cross over to a non-physical dimension; but life does carry on in those forms and dimensions. 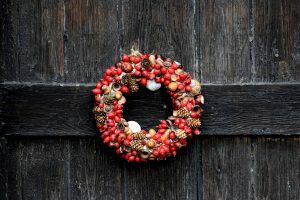 REAL life travels in a circular motion; and therefore, like the wreaths that adorn our windows and doors this time of year, it is unending. When someone you love passes away, it is difficult to accept the fact that you can no longer physically touch him or her, or look into his or her eyes. It takes time, as one of my favorite John O’Donohue blessings describes, to gradually learn acquaintance with the invisible form of your departed. . . and wean your eyes from that gap in the air. Gap in the air . . . isn’t that the perfect way to describe it? Out of habit, you turn to share some thought or story with your passed loved one; but when you look over your shoulder and start talking, you realize that there is no one else there. Or is there? Are they gone, for REAL? The REAL tea is that, though loved ones become intangible and invisible to us after they pass from the Earth, they can be seen and sensed in new ways. I have experienced this, and it is for REAL. My departed family and friends communicate to me in a variety of ways: through lucid dreaming, musical lyrics, movie lines and scenes, words that come through in random conversations with other people (often strangers), experiences I have in nature, books I read, and number patterns. I notice these whispers from the other side, because I choose to be fully awake, mindful, and open to receiving them. You can too. Perhaps you already have? To be clear, none of this has to do with getting on a religious soapbox or going on a paranormal rampage. This isn’t about church, and it isn’t about ghosts. It is about recognizing an often overlooked, yet very REAL, truth. You are a brilliant ball of energy, and so is every other person. Energy does not disappear, it simply changes in state. 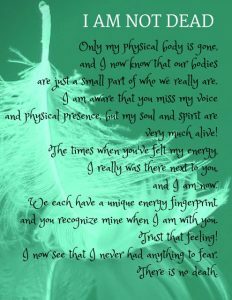 When someone you love crosses over to the non-physical dimension, he or she is not gone . . . he or she is just transformed into a new state. Hence, the way in which you interact with him or her must also transform. The REAL tea is that you do have the power to communicate with your passed over loved ones any time you wish (if you wish). The mere utterance of a departed beloved’s name will bring him or her to your side instantaneously. No sh*t. It happens. Embrace this as a possibility, open your third eye, and slow down so that you can tune into a new frequency. Look up from the chaos of daily living long enough to gain spiritual focus, and you will receive messages over the spiritual airwaves. Try it! Make it simple: Say your passed loved one’s name out loud, and repeat it over and over in your mind. Picture that person sitting right across from you, and ask him or her to send you a sign that they s/he is around and listening. Don’t be too specific about the type of sign you want, spirits enjoy being creative and want to come up with their own unique methods. Trust that the answer will come, and that you will recognize it when it presents itself. Stay open and awake. Try it! 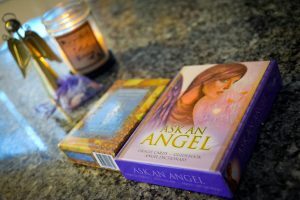 Add to your spiritual toolkit: If you don’t already have one, treat yourself to a deck of angel cards. Shop around, and find a deck that REALly speaks to you (i.e., do the theme and imagery resonate?). Use the deck as a channel through which to ask for guidance from your passed loved ones and other guardians, and implement either daily or weekly personal readings into your routine. Email me via my contact page when you receive your answer, or tell me about similar experiences you have already had. I would love to hear your stories! In July of this year, I made an appointment at one of my favorite local shops, Full-heart Soulutions, with a fabulous local angel reader, Doreen Marie. 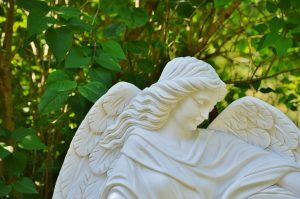 I have seen her about once a year for three years (though she only knows my first name), and I always come away from the sessions with poignant and helpful messages from my angels and departed loved ones. 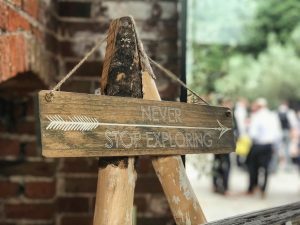 In mid-summer, I was in the throes of making several changes in my life; and I was eager to hear what my guides, guardians, and ancestors had to share with me about my new path. I was especially eager to hear from my grandmother, and I asked her to show up. Within minutes of the session starting, Doreen told me that there was a woman standing behind me that she sensed was a grandmother figure. She described my grandmother vividly and said that she was holding out a dozen yellow roses and saying “congratulations” to me regarding my new creative endeavors. Apparently, my grandmother stuck around for the whole reading. Towards the end, Grand-mom asked Doreen to pass along with word, ruby, guessing it was someone’s name. Doreen did not recall that just 2 years before, my maternal grandfather, “Poppy,” had come through and was holding his ruby ring (which I had been given when he passed). The morning of that original reading, I had been alone in my bedroom, held his ring in my hand, and asked him to assure me of his presence by showing up to my reading and saying something about the ruby. I never told anyone that I had asked him to do that, but he did. It was great to hear from him again. This is the first December in my life that my grandmother, Mary, is not in the physical world. I have not been sad, though, because she has shown herself and said hello to me in so many ways over the last few weeks. 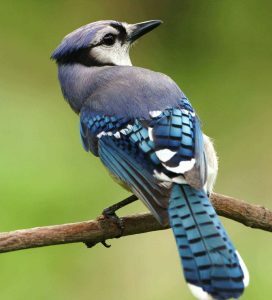 She took the form of a blue jay and flew across my path during a trail run. She managed to make my music spontaneously switch over (mid-song) to Nat King Cole when I was driving alone. She said a soft hello when I opened an unexpected package from her hospice care team, a beautiful holiday ornament. Still, I have continued to secretly long for additional affirmation that she is nearby. And I have received it . . .
A sea of trees. . . the image resonated with me and conjured a warm and comforting feeling. I was immediately at peace just imagining what my friend described. She knows me well. If you asked me to make a list of the top 5 settings I would most wish to immerse myself in, by the ocean and in the forest would both be on it. Within a day or two of reading the message, I discovered that a movie called The Sea of Trees had indeed been recently added to Netflix. When I stumbled upon it, I felt a gentle tug to watch it (though I had no clue what it was about, but hey, it starred Matthew Mcconaughey!). I refrained from uploading it in that moment, however. Something deep down inside told me that I would intuitively know when the time was right to press play. Two weeks later, my husband asked me if I felt like watching a movie. A switch immediately flipped in me when he asked, and a wide grin spread across my face. You guessed it – I suggested The Sea of Trees. To be REAL, I was hesitant to write this blog. The prospect of communicating in any way with the non-physical world can make people uncomfortable, and I understand and appreciate that is a touchy topic for many. I even started another blog, because I was so conflicted about posting this one. Each time I doubted myself, though, another sign arrived and encouraged me to stay on course. Once the door is opened, the messages are non-stop (which is REALly cool!). This past Wednesday, my oldest daughter, Ella, visited Doreen for her first angel card reading (Doreen had no idea she was my daughter). Ella later told me that as soon as she sat down, Doreen explained that there was a woman standing behind her who was saying she was the person after whom Ella is named. She described a younger version of my grandmother, Mary, with long legs, auburn hair . . . the whole bit. My daughter’s full name is Isabella Maria, but for the longest time I toyed with naming her Mary Ella (Mary, after my dad’s mother). I ultimately decided on integrating my Italian heritage into the mix, and ended up using Maria, the Italian form of Mary, as a middle name. Reportedly, my grandmother stuck around for Ella’s whole session. Towards the end, Doreen told Ella that a light-eyed man also appeared, calling himself either pop or poppy, and talking about something or someone called ruby. I laughed through tears as she recounted the story. I heard the message loud and clear, and here we are. They want you to know that your departed loved ones never REALly did depart. They are always only one heartbeat away from you, in any given moment. And that, my friends, is the REAL tea. Get REAL inspired about seeing REAL signs from your departed loved ones, and begin to communicate with them in REAL ways. Check out more REAL resources in the library! Allow me to share my resources and sign up for your REAL email.